At last, a comprehensive cookbook to the hottest eating plan around! 500 Ketogenic Recipes is the ultimate starter guide to getting healthy, building muscle, and managing blood sugar. The ketogenic diet emphasizes high ratios of healthy fats, moderate protein, and low carbohydrate intake. While the ketogenic diet isn't new -- there is newly emerging research that the ketogenic lifestyle may help reverse illness, promote longevity, and be the best diet for losing weight. Millions of people are transitioning to a ketogenic diet to look and feel their best. 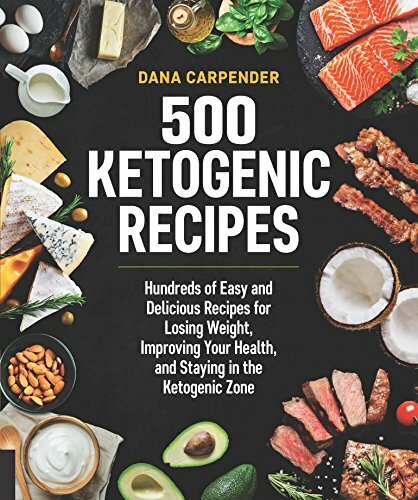 Low-carb queen and bestselling author Dana Carpender shows how to live the ketogenic lifestyle deliciously with 500 easy-to-prepare recipes for everything from snacks and appetizers, to main dishes, to drinks and dessert. 500 Ketogenic Recipes makes staying in the ketogenic zone simple with hundreds of recipes, pantry and shopping lists, and ketogenic do's and don't's. Would have loved more pictures, but I am enjoying trying all the recipes. Most are simple and easy to do yet offer a lot of variety!